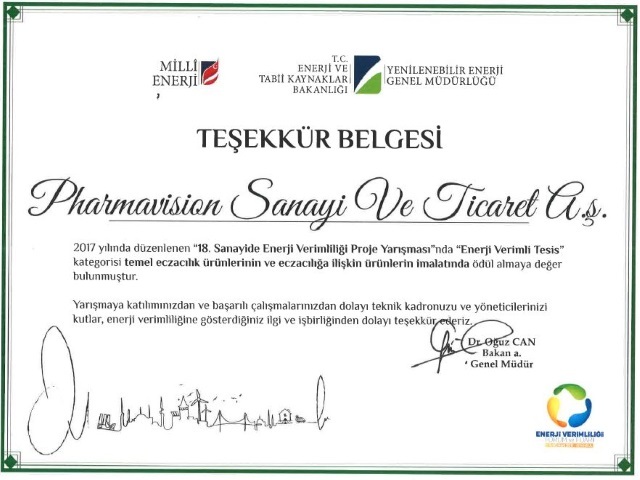 PharmaVision - News > We have been honoured with the First Prize for Reducing Energy Intensity in Industrial Business Category in our Sector in the "Project Competition for Energy Efficiency in the Industry"
Within the scope of the annual "Project Competition for Energy Efficiency in the Industry" organized by the Ministry of Energy and Natural Resources for the 18th time, PharmaVision was awarded with the First Prize for Reducing Energy Intensity in Industrial Business Category this year, in recognition of energy efficiency project in the manufacturing sub-sector of basic medicinal products and medicine-related products, based on the data we annually enter regarding our energy consumption information to the system, where at least 20 plants are registered in our sector, by way of reducing by an average of 16,7% the energy intensity of the years 2014 - 2016 compared to the Reference Energy Intensity (REI) between the years 2009 and 2013. This award have made us all happy, considering the fact that respect for the environment is one of our principles and that, even more important than the reduction of energy costs, we have contributed to the reduction of carbon emissions, which is one of the most important and most discussed topics of our times. Our Technical Director, Mr. Necmettin Ayan received the prize with pride from the Deputy Chairman of the General Directorate of Renewable Energy Dr. Oğuz Can and İTO Vice Chairman Mr. Gökhan Murat Kalsın on March 29th, 2018.